October is my favourite time of the year because Halloween is hereeeeeeeeeee! Sadly, it's not part of our country's culture but the funny thing is we still celebrate this occasion for the fun of it lol. So if you don't have any plans for this year's Halloween why not join me and Allianz Bank to celebrate this ghoulish Thursday! 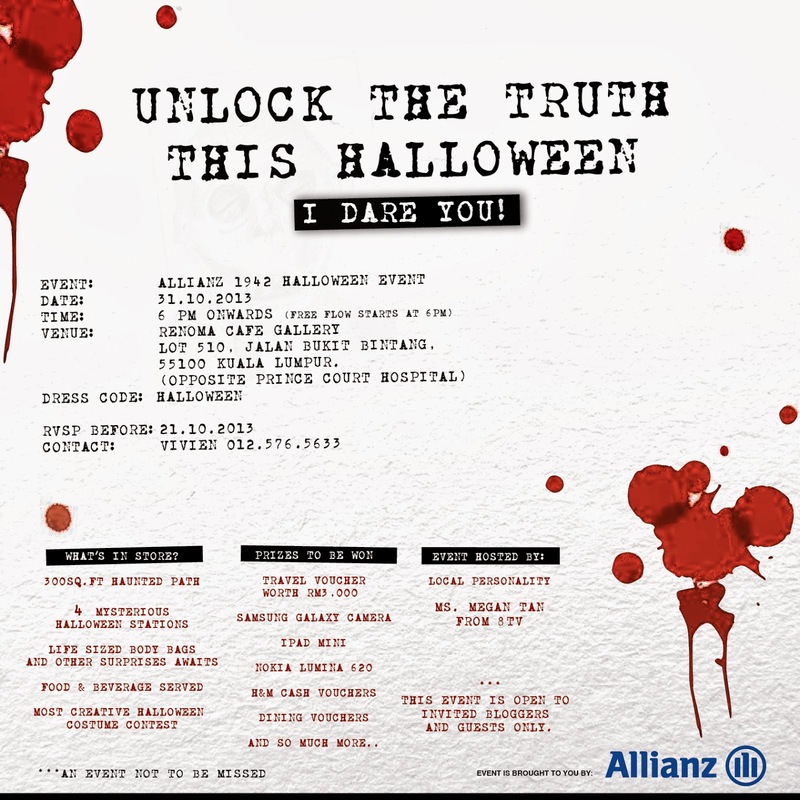 Of all things, a cooperate event with a ghoulish theme? Sounds pretty interesting eh lol. There are tons of prizes up for grabs for the best dressed too! Hint: you might be able to win travel vouchers worth RM3,000. Now I have to think of what I'm going to wear for this event :-P Hopefully I do have enough time to put together a costume lol. Any suggestions? The reason why Allianz Malaysia is having this fun party is to get together with their customers as a token of appreciation and also to share about their new brand awareness program. Giving you the assurance that you are always safe and protected with their services, better to be safe than sorry especially during the festive season. This is a by Invitation and blogger’s event. Don't worry if you are not a blogger, feel free to participate in this event too by leaving a comment below with your email and i will pick 3 random winners on the 20th Oct.
P/S: Any bloggers interested to attend this event please RSVP by contacting Vivien at ask@whatisfotobox.com or 012-5765633.